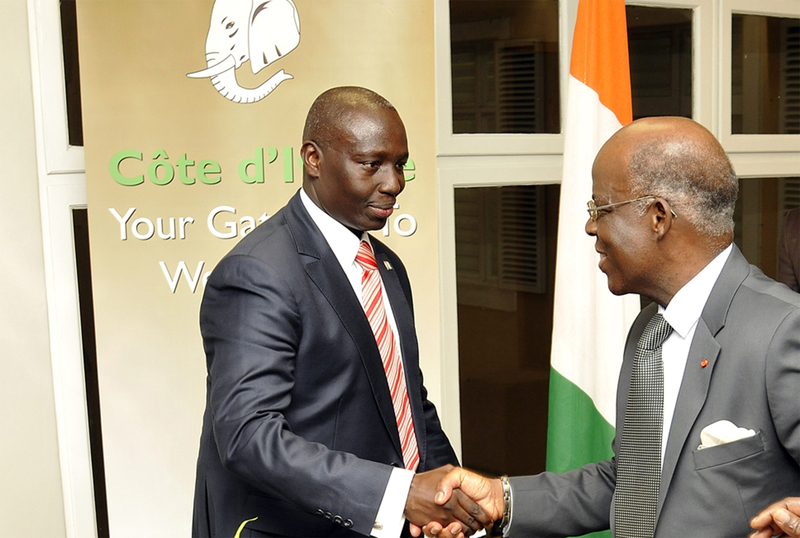 Côte d’Ivoire’s Ambassador to South Africa, HEM Amos Djadan Koffi, Congratulates the Economic and Trade Representative, Mr. Patrice Mallet on the occasion of the office inauguration. Côte d’Ivoire’s Economic and Trade Office, located in Sandton, Johannesburg, South Africa, promotes Côte d’Ivoire’s economic and trade interests in southern Africa by enhancing understanding of Côte d’Ivoire among opinion-makers; closely monitoring developments that might affect Côte d’Ivoire’s economic and trading interests, and liaising closely with businesses, politicians and the news media. The Economic and Trade Office in Johannesburg officially opened on December 3, 2013. It falls under Côte d’Ivoire’s Economic Promotion Services, housed in the Ministry of Economy and Finance. This administrative arrangement allows the Economic and Trade Office to stay abreast of the latest policy issues and align its strategy closely to the nation’s economic priorities. Thus, the office is able to provide investors with the very latest and most accurate information. We arrange senior officials’ visits to the countries under our purview to facilitate high-level exchanges between Côte d’Ivoire and these nations. We also organise trade and investment promotion seminars, and cultural and networking events. Our objective is to promote Côte d’Ivoire’s position as an attractive investment destination and the gateway to West Africa to our contacts in the political, commercial and media sectors.